Despite some official statements that Ubisoft recently gave to avoid further disparagement regarding the fact that its upcoming next-gen exclusive, historical-adventure open world video game title called Assassin’s Creed Unity will run at a native resolution of 900p and 30fps on the latest PlayStation 4 and Xbox One consoles, the French video game company is still taking quite a lot of flak from gamers, and it looks like it is really annoying some developers behind the game. Recently, an anonymous Ubisoft developer sent out an email that threw some light on the difficulties that the development team faced while optimizing Assassin’s Creed Unity on latest consoles, and claimed that the PlayStation 4 couldn’t run the game at 1080p/30fps. A week ago, senior producer behind Assassin’s Creed Unity, Vincent Pontbriand, revealed that the game will run at a native resolution of 900p and 30 frames per second on the latest PlayStation 4 and Xbox One consoles, and said that this decision was made to avoid all the controversial debates and stuff. However, Ubisoft told Kotaku the next day that the game’s technical team started working from the ground to achieve maximum optimization, and 900p was the final attainable resolution, thus it represents the technical limitations of both systems. Aesthetics of 30fps were defended by Alex Amnico shortly after Ubisoft’s statement. Despite the clarification, the online gaming community remained skeptical, and it was generally thought that PlayStation 4’s ability to run Assassin’s Creed Unity at higher resolution has only been suppressed to achieve parity between the latest consoles. However, in a recent email that was sent out to the Giant Bomb crew by an alleged Ubisoft developer, it has been clearly mentioned that the PlayStation 4 “couldn’t handle Assassin’s Creed Unity at 1080p/30fps.” The email further explains how Ubisoft achieved 900p/30fps and what were the adversities that the development team had to face along the way. The email was read during October 14’s Giant Bombcast. The anonymous developer who sent this email was even willing to provide his position as verification. Nevertheless, we are still looking out for confirmation and this story will be updated with new information as soon as it becomes available. Until then, you can read the transcript of the email that has been provided by NeoGAF user BruiserBear. We have highlighted the important words. 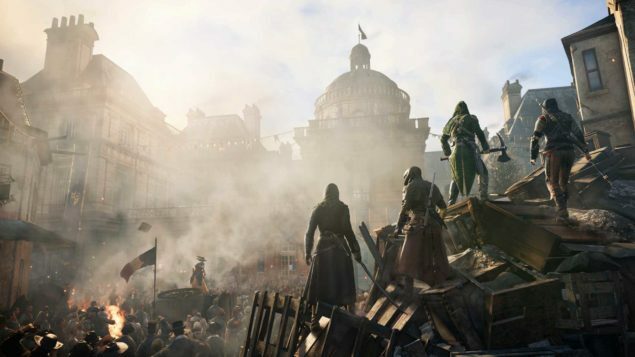 Ubisoft’s troubles are not limited only to Assassin’s Creed Unity. In a recent report, it has been revealed that Microsoft and Sony are pressuring the French video game developer to lock its next-gen games at 30fps on PC, apparently to achieve parity with the latest PlayStation 4 and Xbox One consoles. You check out the complete report here.